But what is a party without the hottest summertime sandwiches? 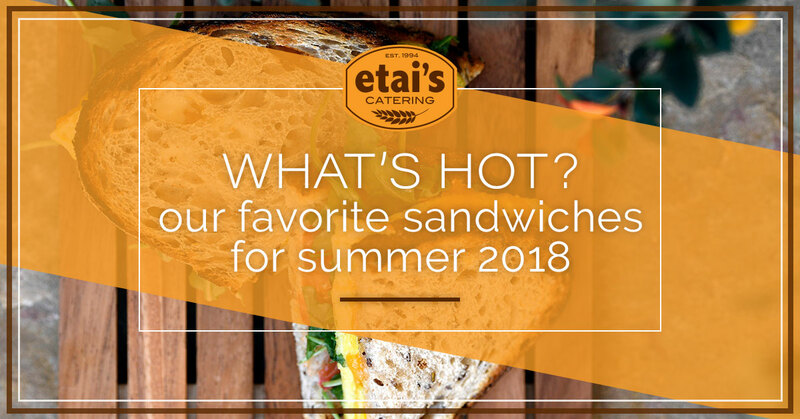 At Etai’s catering, we have a wide assortment of melted sandwiches, all of which are freshly made in our Denver artisan kitchens and bakeries and which are perfect for your next party or catered event. In this blog, we’ll identify some of our hottest, most flavorful, and most popular sandwiches for the 2018 season. Looking for Denver catering services? Then you’ve come to the right place. Browse our menu for yourself and choose your favorite sandwiches from our vast lineup and have them included in your event spread for the summer. Now without further ado, let’s get to the good stuff — here are our favorite sandwiches for the summer of 2018. Contact Etai’s Catering today to make your selection. You know, the turkey was almost our national bird? Well, maybe that little bit of trivia is somewhat of a myth, but nevertheless we’re glad that it wasn’t adopted as an historic symbol because these sandwiches would be missing one special ingredient. This blog is about the hottest sandwiches of 2018, is it not? With that being said, this one brings the heat — literally. Our spicy jalapeno-cheddar turkey sandwich features roasted turkey, bacon, avocado, lettuce, cheddar cheese, tomato , and mayo, all served on made-from-scratch, artisan jalapeno bread. How can you go wrong with a little bit of fresh avocado? This summertime favorite combines America’s favorite super food along with roasted turkey, sliced tomato, lettuce, and a savory aioli spread. All of these ingredients are nestled between two slices of delicious, soft, home-baked wheat or levain bread. A classic at any event, during any time of year, the turkey club is one of our all-time favorites. This sandwich combines all of the essentials — roasted turkey, ham, bacon, lettuce, tomato, and a light mayo spread served on soft, levain bread. Order any one of our tasty turkey sandwiches as part of your next catered lunch today. You read that headline correctly. New to our Denver catering menu are these unique, delicious sandwiches available in several different flavors. As with all of our breads, we bake our pretzel sub rolls locally and serve them fresh to order as part of your catered box lunch spread. Tuna. Pretzel roll. Enough said. This Etai’s Catering favorite features tuna mixed with our special Fire Tomato Salsa and mayonnaise, sandwiched between our salty homemade pretzel sub. The perfect fresh submarino for the perfect summer day. Our Mediterranean veggie pretzel sub comes piled high with fresh mozzarella cheese, a signature Mediterranean spread, romaine lettuce, red onion, alfalfa sprouts, and mayo. Want to try our homemade pretzel subs at your next event? Order Denver catering online today exclusively from Etai’s. The sandwich party doesn’t stop there. When you hire Etai’s for all of your Denver event catering needs, we provide an unparalleled selection of sandwiches, boxed lunches, and other goods that are sure to satisfy all of the taste buds at the event. This one is as prestigious as it sounds. Stuffed between our signature levain bread, which is baked right here in our local artisan kitchen, comes roast beef, smoked turkey, aged Dutch Edam cheese, sliced tomato, lettuce, and aioli spread. Want a new twist on one of the classics? Everyone loves Etai’s Hero, which comes with a generous helping of salami, ham, Dutch Edam cheese, olive tapenade, lettuce, tomato, and light mayo all served up on one of our freshly baked hoagies. It wouldn’t be right if we left out those with greener tastes. To offer something for everyone, consider including a few of our delicious vegan sandwiches as part of your event catering spread. The Vegan comes with sliced tomato, cucumber, lettuce, avocado, sprouts, our spicy Moroccan carrot spread, dijon mustard, and a soft-baked olive bread. This is just a small taste of what our fresh, local caterer has to offer. Download our new menu and place a catering order online with Etai’s in Denver today!